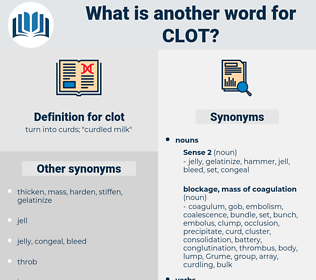 What is another word for clot? turn into curds; " curdled milk"
intellectual, whiz, intellect, entity, item, egghead, polymath, single, genius, wizard, sharpie, thinker, unit, sage, brain. The lynx was already rigid, its clumsy paws asprawl - the torn skin and clot upon Trafford's face was stiff as she put her hands about his head to raise him. chunk, lump, ball, glob, clump, clod. change, turn, alter, modify, coalesce, change state.